If you are looking for an outdoor wedding venue in Cheshire, Capesthorne Hall has three outdoor locations licenced for a civil ceremony. 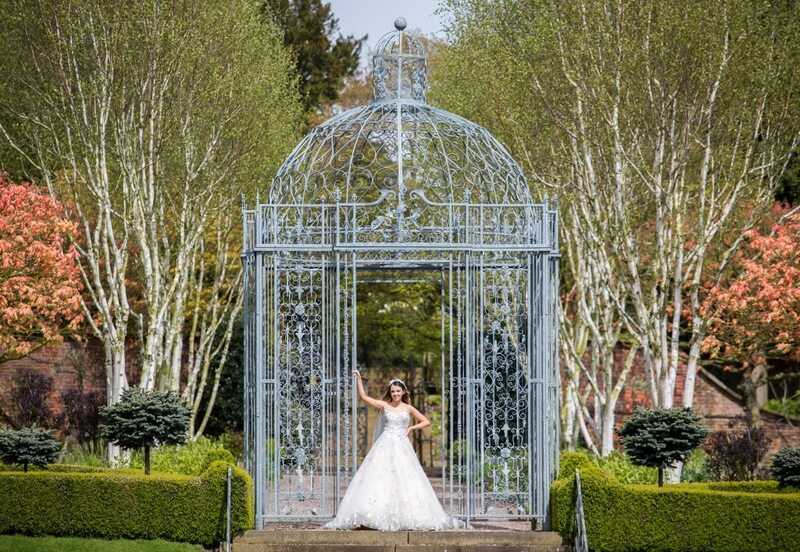 The stunning Lakeside Gazebo is set in our beautiful formal gardens. The ornate Gazebo provides a stunning outdoor wedding setting that will create wonderful wedding memories at any time of the year. The tree lined avenue leading down to the Gazebo creates a natural wedding aisle for the bridal procession. With guests seated either side of the aisle and on the lawns to the left and right of the Gazebo, the ceremony can be enjoyed by all. We are also licenced for outdoor weddings in the Courtyard in front of the impressive Jacobean Hall. What better setting for an intimate ceremony steeped in 300 years of history. For those with a love of nature, our third outdoor venue is the Woodland Dome. This is a small gazebo situated in ancient woodland behind the Hall with views to the secluded lower pool. A perfect spot for a magical wedding. Your civil ceremony could be followed by a blessing in the family chapel situated adjacent to the formal gardens. 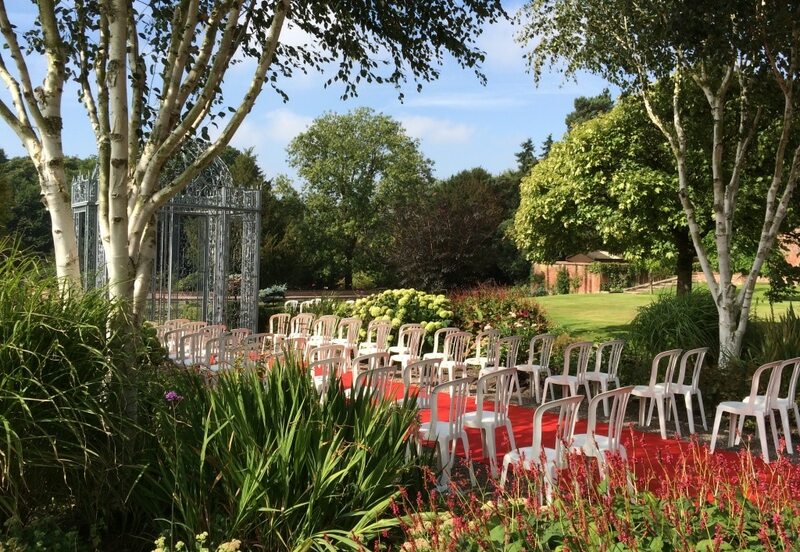 Following the ceremony, your guests can enjoy a drinks reception on the lawns in the formal gardens or enjoy the woodland walk in the 100 acres of Cheshire parkland taking in the beautiful surroundings. Alternatively, your guests may choose to wander round the Hall taking in the history of Capesthorne. Should the weather conditions prove unsuitable for an outdoor wedding, your ceremony can be held in the Drawing Room in the Hall for up to 120 guests or, for larger groups, in the Lakeside Wing for up to 160 guests. If you choose to marry outdoors an indoor contingency is always set up as a back up. On the day, it is the registrar’s final decision as to whether your ceremony can proceed outdoors. rooms in the Hall or in the Lakeside Wing marquee and garden room. 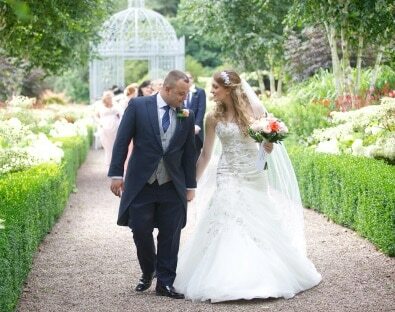 All weddings at Capesthorne are exclusive, including our outdoor weddings. To see for yourselves, please contact us to arrange a viewing.